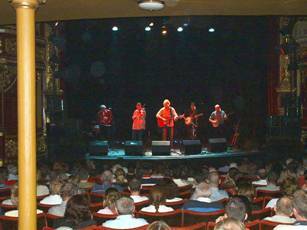 The Everyman Theatre in Cork played host to a special tribute to the late great Luke Kelly on Sunday 31st August 2003. The show was opened by Aoife Clancy and was followed by the main act, of which some famous traditional names were included. The band, Brian Roebuck on vocals and 12 string guitar, Gerry O’Connor on tenor banjo, Pat Kelleher on banjo, Mick O’Brien on whistles and uileann pipes and on fiddle, Dezi Donnelly. From the opening bars of nostalga, ‘The Rare Ould Times’, the audience were treated to a performance of Luke Kelly’s finest. Brian Roebuck, with his own Dublin brogue in tow, brought songs to life that are rarely heard sung with such feeling anymore. Right through songs like Dirty Old Town, Peggy Gordon, The Town I Loved So Well, the audience were made to feel part of the tribute with many joining in the tunes and shouting requests for songs which showed that there were true Kelly fans amongst the audience. After the interval the crowd were treated to a stirring rendition of Luke’s moving poem Sons of Roisin followed by the beautifully moving ballad Raglan Road, sung with passion and clarit; the remarkable similarity of Brian’s vocals to that of Luke made the hairs stand on your neck. From this point on the musicians on stage came into their own and once they kicked into God Save Ireland there seemed to be no stopping them , even breaking into an impromptu session of The Masons Apron that could possibly have gone on all night without any objections from the audience. The two banjo maestros, Gerry O’Connor and Pat Kelleher playing tenor and long neck folk banjo’s respectively, graced the stage with wonderful dexterity . That, coupled with Dezi Donnelly’s ability to make the fiddle talk with perfect diction and and Mick O’Brien’s beautifully flowing whistle and pipe playing, brought together a band so musically talented on stage that one hopes that this was not just a one off, and with the renowned voice of Brian Roebuck, what better instrument is there to pay tribute to possibly the greatest ballad singer this country has known. With the closing notes of The Auld Triangle the band left the stage only to be called back time and again by an audience that genuinely did want more. As Brian sang the final song- Luke’s version of ‘The Night Visit Song’ I swear there were tears in the eyes of the appreciative and knowledgable folk of Cork city and its surrounds. (It was the last song Luke Kelly ever sang on stage before he died in 1984). The tribute concert to Luke Kelly came to an end with a Monto style ‘good night to you’ from from the band and a rousing applause from an audience didn’t want to leave.